Stan takes a free "personality test" from some Scientologists and is informed, to his surprise, that he's deeply depressed. They promise to help him, for the low price of $240. Stan forks over the cash and has his "thetan levels" monitored using an "E-meter." He produces such a high reading that the results are immediately dispatched to Scientology's Los Angeles headquarters. The President of Scientology says there can be only one explanation -- Stan is the reincarnation of the church's founder, L. Ron Hubbard. Shortly thereafter, a mob of Scientologists (including church leaders and John Travolta) show up on the Marsh family's front lawn. They want Stan to lead them, but his father sends him to his room instead. There he finds Tom Cruise, who asks Stan (who he believes is the reincarnated Hubbard) what he thinks of his acting. When Stan tells him he's "okay" but not as good as, say, the guy in Napoleon Dynamite, Cruise has a meltdown and locks himself in Stan's closet, refusing to come out. Over the course of the episode, a number of people try to get Cruise to come out of the closet including Randy and Nicole Kidman, but their efforts are fruitless. In fact, Cruise won't even admit that he's in the closet. Unable to sway him, R. Kelly and Travolta join him -- both locking themselves in the closet as well. Downstairs, the President of Scientology reveals the church's deepest, most bizarre secrets to Stan. Afterward he says he wants Stan to continue in Hubbard's footsteps by writing more about the events he just described. Stan obliges, even though he protests he doesn't know what he's doing. At first his ideas meet with the church's approval -- until he asserts that Scientology, like most religions, should stop charging people for help. Appalled, the President reveals another of the church's deepest secrets -- it's just a scam to make money, and that if Stan knows what's good for him, he'll play along. He then escorts Stan outside so that he can read some samples of his new writings (soon to be available in book form for a nominal fee) to the assembled crowd. But Stan can't go through with it. He admits that he's not the reincarnation of L. Ron Hubbard and that Scientology is a racket. However, Stan's honesty doesn't go over so well. Instead of turning on the Scientology leadership, the followers scream at Stan for defaming their religion and threaten to sue him. Relieved that the boy isn't actually Hubbard, Tom Cruise (as well as R. Kelly and Travolta) finally comes out of the closet. Just like everyone else, Cruise threatens to bring a lawsuit. But Stan holds his ground and dares them to do their worst. "Look everybody we're all looking for answers. You know? We all want to understand who we are and where we come from, but sometimes we want to know the answers so badly that we believe just about anything." The evil Lord Xenu, the lead bad guy in Scientology's creation story. The account of how he sent millions of beings into exile on a prehistoric Earth fits in quite nicely with South Park's other science fiction-themed episodes. A whole hierarchy of Scientologists also make their debut -- from Brian the "thetan level" tester all the way up to the President of Scientology. An all-time South Park record, if one counts the millions of aliens allegedly exterminated by Lord Xenu. Matt and Trey tackled Scientology obliquely in Season Five's "Super Best Friends." This time they went for the whole enchilada, creating arguably the most controversial South Park of all time -- both for its attack on the famously litigious Scientologists, and for the "closet" subplot featuring the only-slightly-less-litigious Tom Cruise. The episode's title is taken from the 22-part music video/soap opera Trapped in the Closet, created by rapper R. Kelly. Just as he does in the series, he sing-narrates everything he does here. The scene in Stan's bedroom with R. Kelly, Travolta, and Cruise is a particularly awesome parody of Episode I & II of the music videos. In the opening scene, the boys are talking about the trading cards they just bought -- Kyle's pumped that he got a "Jake Plummer" and Cartman's bummed that he got a "crappy A.J. Feeley." Both are professional players in NFL. Stan's bedroom also has a ton of Denver Broncos paraphernalia in this episode, including a poster of John Elway. When Tom Cruise pleadingly asks "L. Ron" (Stan) how his acting is, Stan says "he's OK" -- he's not as good as Leonardo DiCaprio, Gene Hackman, or that guy who played Napoleon Dynamite (Jon Heder), but he's OK.
During a re-telling of the Scientology origin story, the words "This is what Scientologists actually believe" appear under the action. This is to avoid the sorts of misunderstandings generated during "All About Mormons" when a completely accurate retelling of the story of Mormonism seemed so absurd that some viewers thought Matt and Trey made it up. All of what's shown here -- the Dianetics book, personality tests, "auditing," "thetan levels," etc. -- stays true to the Scientology religion. 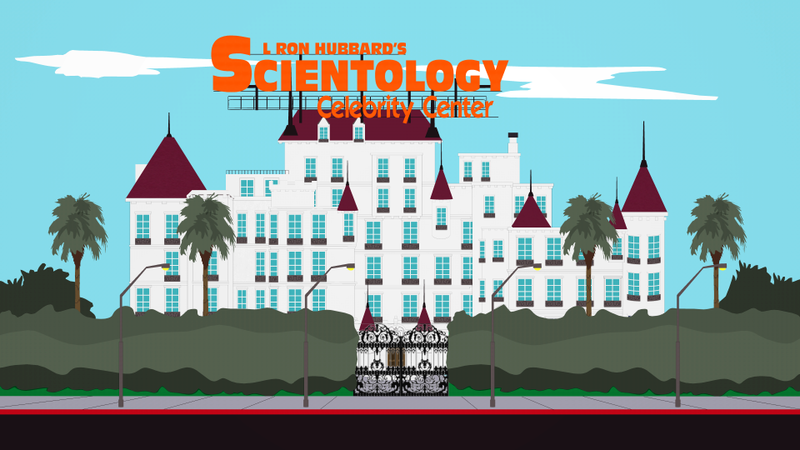 Furthermore, the Scientology Celebrity Center seen here is modeled after the very real, equally massive mansion of the same name in Los Angeles. It's also true that L. Ron Hubbard was a science fiction writer. A number of celebrities get the royal treatment in this episode. Most notably Tom Cruise, a famous advocate of Scientology, who is portrayed here as a highly-emotional, somewhat delusional person. John Travolta (also a famous Scientologist) doesn't fare much better -- he runs around screaming "oh my God!" repeatedly and eventually refuses to come out of the closet as well. R. Kelly and Nicole Kidman (Cruise's one-time wife) also get a nod here. So does "author" and "prophet" L. Ron Hubbard. Mr. Mackey is one of the many townspeople considering joining Scientology in the beginning of the episode. During the description of what Scientologists believe, there's a scene where an assembly line of aliens are being frozen. In it, there is a Marklar (from "Starvin' Marvin in Space") and an already-frozen, partially-visible Joozian (from "Cancelled"). When the souls of these dead aliens were later "forced to watch brain washing material" (with 3D glasses, no less), they were treated to visions of Jesus, Buddha, and ancient Egyptian hieroglyphics. In the closing credits, the names of everyone who worked on the show are replaced with the names "John Smith" or "Jane Smith."